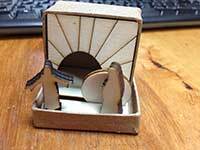 Following on from our hugely popular Nativity in a box we have a 3d Easter garden which folds down into a sturdy 5cm box. Perfect for slipping into a pocket the kit includes a paintable box with lid, the empty tomb front, Mary & Angel and a background showing the grave cloths. It even has a mini stone over the entrance which can be moved to open the tomb.